Bob Mayer probably doesn’t remember that he gave me advice that got me published. It happened, ok? If you’ve finished your book, the next step is representation or a small press. You’ve done your research and found the perfect agent who is simply gonna LOVE your work. But you have to make it from your email “Sent” box to her email “Read box” and this is not always easy.This means, of course, the dreaded query letter. Don’t know how to get started? Here are some quick tips. 1. Do find out who to send it to, specifically. Go on the agent’s website and find the name of the agent who is simply ON FIRE about your genre. 2. Don’t begin your letter with: “Dear Editor.” Nothing says “I’m a lazy writer who can’t be bothered with details” like a lack of research here. 3. Do follow the guidelines set forth on the website for submissions. If you go to all the trouble to write a query letter without checking the website first, you may miss the part where they decided to be “closed to unsolicited submissions.” Which, in this case, is yours. 4. Do pay attention to details. If the website says, “Send the first three chapters” or “wait for our response” follow their directions. Even if your query letter is awesome, if they don’t tell you to send it and you attach your manuscript, guess whose email is probably going to be ignored? Yours. 5.Don’t send out a spammish query directed towards many agents at once. You really have to make the agent believe that he or she is the perfect fit for your book–and this is the opposite of that. 6. Do be brief and value the agent’s time. Get to the point. Many agents quit reading after the first few sentences if it’s laborious to do so. 7. Don’t brag as if you’ve written the next Harry Potter or Hunger Games. It’s ok to mention that your book is targeted at the readers of a specific book, though. 8. Do mention previous publications, if it’s relevant. If you’ve won a writing contest or published a short story somewhere, mention it briefly. This automatically gives you a tiny bit of an edge over someone who hasn’t. 9. After hitting the “send” button, DO relax. Most agent’s websites give you a turn-around estimate of time you will probably have to wait to hear back from them. Don’t annoy them beforehand. This, dear writer, is the hardest part. Waiting. In the past couple of years, I’ve had quite a few adventures. Many of these events in my life would not have happened had I listened to that voice in my head that says, “You can’t do that! Who do you think you are?” I hate that guy. Here are some of the things I’ve been able to do by simply ASKING: writing a humor column for a college newspaper, speaking at a major writers’ conference in Dallas–twice. Writing book reviews for a magazine (where I get paid to read fabulous books, and get the books for free), and getting my novel published. A couple of times I’ve been on a talk show to promote my book. If you’re wondering: I’m not great-looking, super smart or even well-spoken. I’m just bold and kind of tenacious and maybe a tad obsessive. But I also battle laziness and a dislike for rejection. But let me tell you: every time someone says “yes,” it feels like a million bucks. Here are 5 ways to encourage you to dream big. 1. List your craziest dreams. What have you always wanted to do? 2. Think about you as a kid. What were your dreams then? Did you love playing nurse and putting band aids on your stuffed animals? Did you tell your dolls stories every night before bed? Did you wish you had a treehouse? 3. Translate your kid wishes to adult. It’s not too late to go to nursing school. Why don’t you call around and inquire about some of the best programs right here in Tyler? Love to tell stories? Write one, or two, or a novel. Build a treehouse for your son or daughter–and you–to hang out in. 4. Up the ante. What is your crazy dream that you’ve never told anyone? Always wanted to be a stand-up comedian? So do it! Find an open-mike night at a local restaurant or club. Use your computer or phone to record yourself telling jokes to practice. Want to be a writer? Join a writers group and find accountability and friendship. 5. Don’t put it off. Set a date for the first step towards your goal and keep it. On Friday, I will apply to the nursing program. By next Tuesday, I will have finished this short story or poem and begin writing a new one. Find that writer’s group. This weekend, go to the hardware store and buy the materials for a treehouse. Take the first step! I dare you to make your dreams come true! It’s always helpful when you’re publishing a book to get assistance promoting it…and free help from the local news is always appreciated. Since War Eagle Women was mentioned on USA Today a press release was written and sent out and several East Texas news stations have picked it up. One thing I love about living here is that the media is quick to help out its citizens. Thanks very much to UT Tyler, East Texas News 4 and KYTX CBS 19 for their help. 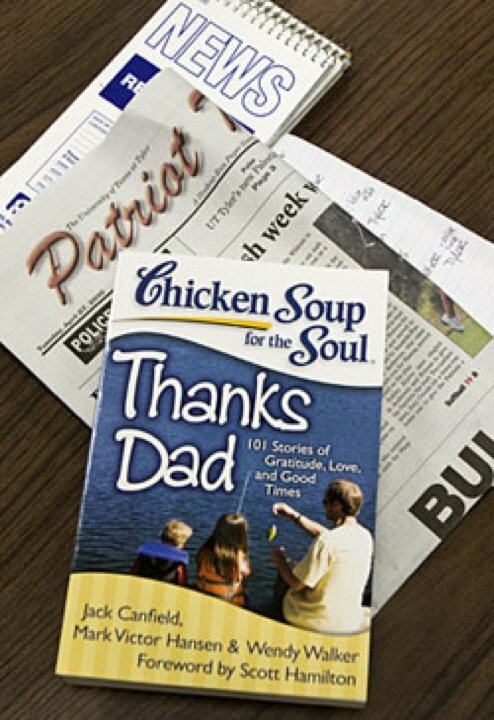 Have you ever seen a “Chicken Soup for the Soul” book? Of course you have! There are 11 million of them in circulation, so they’re kind of hard to miss. Have you ever wondered how the editors choose stories to publish? What if I told you it’s really easy to submit your story? 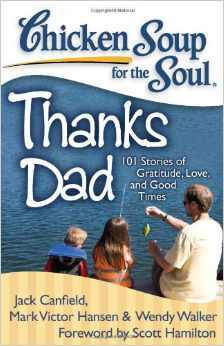 My very first break into paid publication was with a book called “Chicken Soup for the Soul: Thanks Dad: 101 Stories of Gratitude, Love, and Good Times.” I still remember the thrill I felt when I opened the box of books with my story “Thanks Dad” inside. As you might imagine, I was estatic. 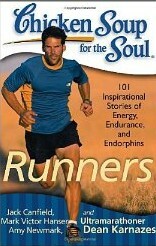 A few months later, I submitted and published a poem in their anthology “Chicken Soup for the Soul: Runners: 101 Inspiration Stories of Energy, Endurance and Endorphins.” Was it because of my vast expertise in the field of running and fitness? Did you read my last post about chicken fried steak? Then you know THAT’S not it. 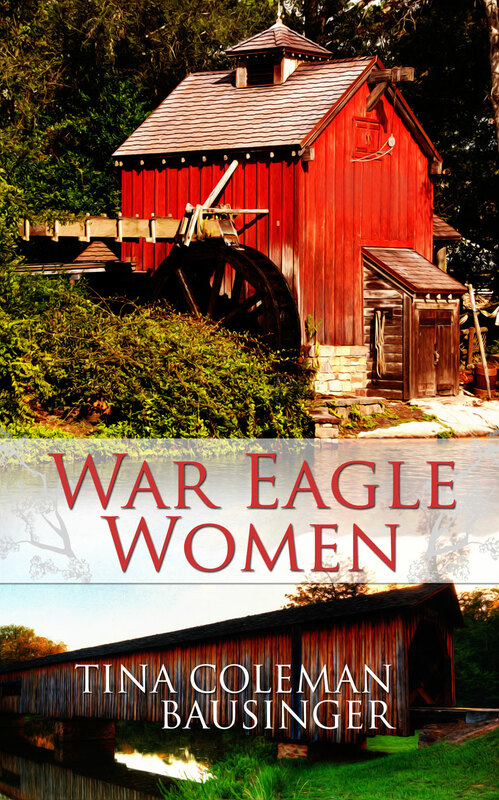 Since my publication with CSS, I have been published many times over, and most recently my first novel, War Eagle Women.I really feel that it was Chicken Soup that got my foot into the door of the publishing world and I want to share this with you. Everybody has a story to tell. I know the gears are clicking! Keep in mind that Chicken Soup publishes a couple of books a month. YOU CAN DO THIS. 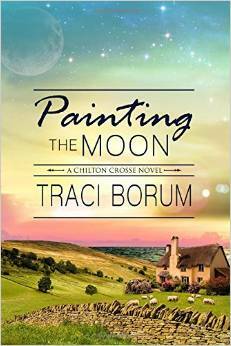 You have a really great shot at finding a book that’s perfect for your story. Here are 5 reasons why you should submit a story to them today! 1. You don’t need an agent. Many large publishers will not even speak to you without one. Chicken Soup accepts unsolicited submissions from anyone who sends them. 2. You don’t have to write a query letter or proposal. It’s as simple as clicking and submitting. 3. Chicken Soup publishes poetry as well as short stories. Few big name publishers will print a poem from an unknown writer. And, CSS pays the same whether it’s a poem or story. 4. Chicken Soup is an internationally known francise. Their books are translated into at least 40 languages worldwide. That’s a lot of publicity for someone who wants to publish a novel.Their website states that at last count they have published 11 million books. 5. Once published with CSS, you gain credibility, not only as a published writer but with an internationally known brand. Did you know that CSS is not just books? They also sell calendars, clothing, audiobooks, dog food and get this…they are making movies from their favorite short stories! You also gain opportunities. I have spoken several times on this very topic, gaining entrance to expensive writers’ conferences FOR FREE. I said it! In addition, because I was a speaker at these conferences, I was able to chat with agents and other writers about my book in a casual way. Agents like to hear that you have published something in such a substantial, well-known brand. It makes them want to take a chance on reading bigger things…like your novel. I know the gears are clicking. And because Chicken Soup publishes so frequently, you have a really great shot of finding the right place for your special piece. CSS is always looking for material, but it must be clean, uplifting and 1200 words or less. Here’s a link for specific guidelines. Ready to submit your story or poem? Click here for details. It’s so easy. Why wouldn’t you want to?